Distance between two people. It's the separation of two hearts. It's a hardship. It's an evident void. It's a feeling of loneliness. It's far from easy. It's what life, at times, puts between us and the ones we love. It's not something we ask for or hope for, but roads diverge. It's how we make do with the circumstances that shows the honesty of a relationship. To me, there is a beauty in parting. In separation. In the miles that separate. In every goodbye there is a "hello" to hold hope for. A "hello" that will be better than every other that preceded it. A reunion that is completely consuming. You re-remember the lines of their face, the way they smell, the way their hand finds yours. There's a rush of stories waiting to pour out of your mouths, but you stay silent because you're soaking up the present, rather than reliving a past when you stood apart. But there is time between these "goodbyes" and "hello's." It ticks by slowly, although we wished it sped up. We fill it with menial tasks, new and old hobbies, and time with other people in our lives. It's the art of keeping our minds occupied when our hearts feel unattached. Instead of pumping within our chests, they are across state lines, oceans, and borders. As promised, they remain with the ones we gave them to. There is an unexampled strength within a relationship handling distance. It's understanding sacrifices that most don't have to concern themselves with. It's placing an emphasis on communication that isn't face-to-face. It's longing for more when more is not possible. It's being devoid of physical intimacy. It's remaining entirely faithful to the commitment you made to persevere, no matter the circumstances. 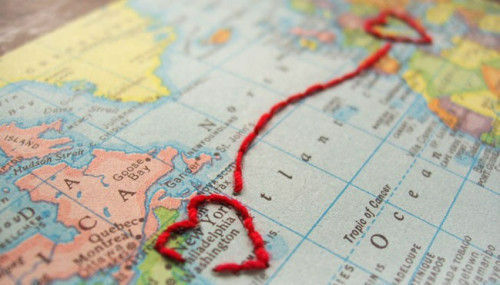 You see, great love is found in the miles that separate two people. Two people who are fully immersed in a relationship with every odd against it. Two people who appreciate everything just a little more because it's fewer and farther between. Two people who have an interminable trust in one another. Two people who took a chance, only to find it changed their lives.